We put aside a couple days last week to come up with some ideas for Fun event sequences then implement them using the event arc structure managed by the Event Director feature (as discussed in the blog post on just that subject). 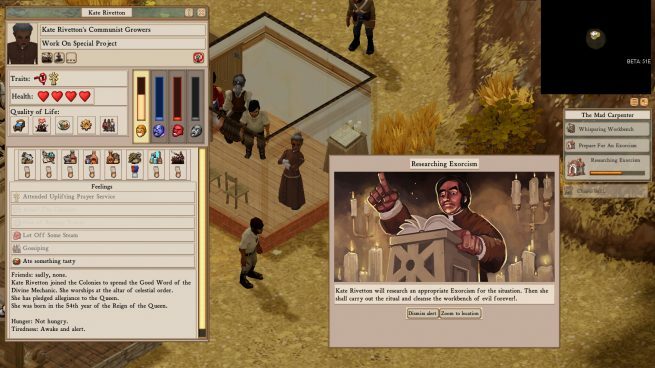 So let’s have a look at an example of one such event – and how event arcs can lock buildings for Special Purposes. 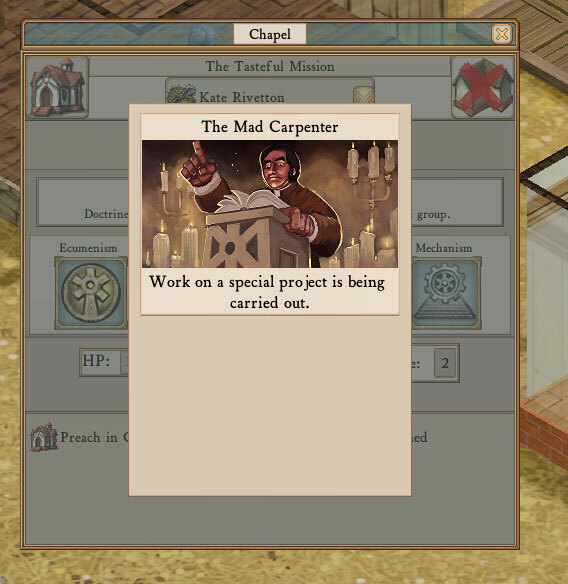 So the colony’s carpenter has a problem. These things happen! There are various ways to solve it (and others problems like it). Determined Inaction is always an option, as is Making A Highly Inadvisable Decision. Sometimes you can call upon the services of one of the specialist offices to resolve the issue by doing a little work. Just so here with the Vicar. Mechanically, this nicely gives value to advanced colony buildings besides just like “make people happy” and ties them – and their overseers particularly – into the narrative drama of dynamic goings-on. 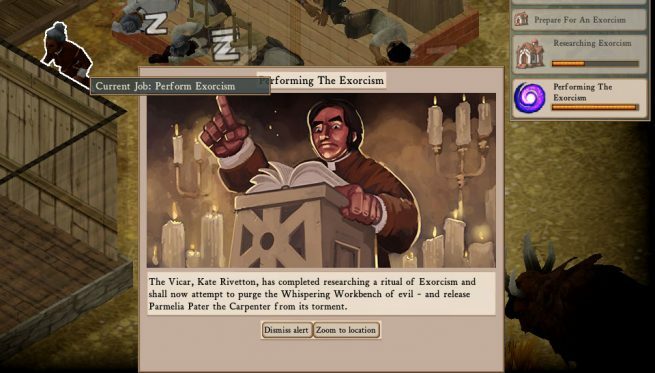 So this event is pretty simple: the Vicar spends some time and researches a proper exorcism. This system however can take different forms: here we meet a simple threshhold to continue to the next stage in the event (or we fail to meet that threshold). 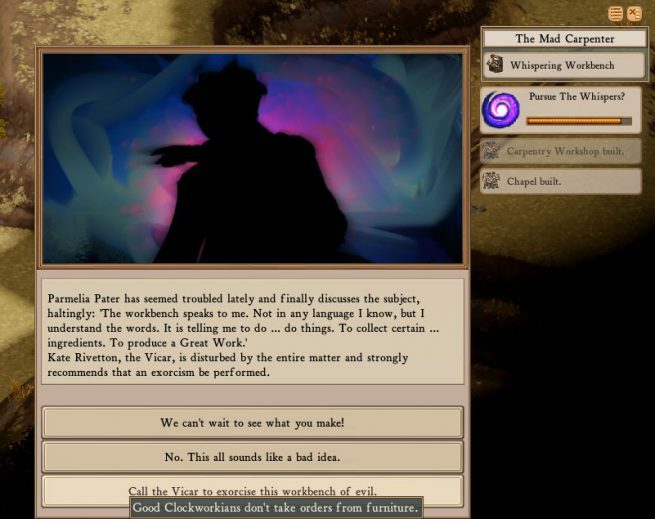 Events can also have the office locked by the event arc generate as many “points” as possible in a given time to unlock different results, the higher the better. Off she goes, Good Book in hand, to deal with The Problem. While lazy labourers sleep on the ground, dreams completely unhaunted by eldritch influences. Very fun idea, can’t wait to see my first fey mood! 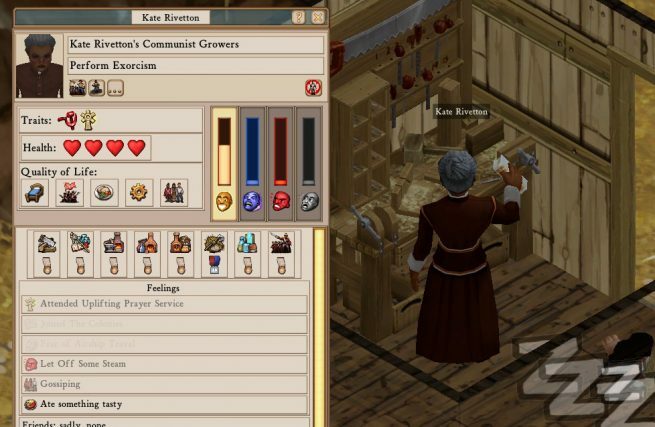 This blog reminded me about cults, which I’m guessing will use the event director system? Huzzah for fun events! Huzzah! Why would ANYone use bing?